Handcrafted products are hard to find these days, that’s why we make the extra effort to source only the most flavorful ingredients in our Country Classics. Our products deliver a mouth-watering taste that you can feel good about serving your family. Time tested recipes using only the finest ingredients. The classics, bologna and mac & cheese loaf have withstood the test of time, and are still available at select locations in Vermont. Tender top round cuts of American beef. Naturally smoked, whole muscle hams with pure Vermont maple syrup. 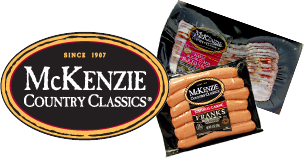 Made with butcher grade cuts of beef and our signature blend of spices these great tasting franks have been a Vermont favorite for over a decade. Our deli franks and natural casing franks are some of our oldest and most beloved recipes. Fresh pork sausages made to order. Authentic old world recipe harkening back to the early days when these were made in the kitchen, these flavorful pork sausages have been a Vermont favorite for over a decade. Handcrafted and naturally smoked. Every small batch of our bacon starts with hand trimmed center cut pork belly sourced from independent family farms in Lancaster Country Pennsylvania. Looking for McKenzie Natural Artisan Products?